The Monte bridal earring set holds an alluring beauty inspired by the Art Deco period. Best paired with luxuriously feminine and chic wedding gowns, this set of pearl drop earrings add regal and feminine flair. The fine crystal flourishes add an antique character with timeless appeal for a look that’s picture perfect. The Monte pearl drops are ready to ship. Please allow 5-7 business days for processing. Delivery times times additional. Rush orders available for a fee. For a look that’s feminine and elegant, we love to style the Monte pearl drop earrings with headpieces or combs featuring silver details and antique accents. Our favourite combinations include the Monte set with the Chantilly or Lauder beaded crowns, the Marion headpiece, and the Alessia or Jasmine headpieces. For brides seeking a minimal yet sophisticated bridal look, pair the Monte with a raw cut veil in chapel length. If you’re craving a look that’s inspired by the beauty of yesteryear, style the Monte pearl earrings with an elegant lace trimmed veil. We are always more than happy to offer product and styling advice. 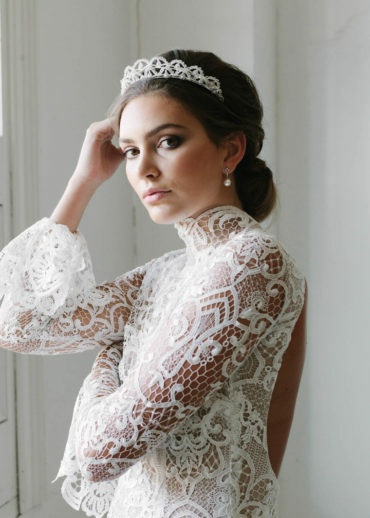 We know how important and difficult it can be to find accessories to complement your wedding gown so please feel free to send us photos of your wedding dress, bridal hairstyle and any other details you think will help us understand your style. We hope to hear from you!